Please refer to our stock # SC-CD when inquiring. 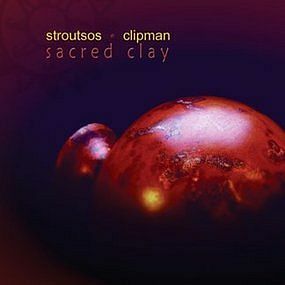 “Sacred Clay” (Red Lightning World, 2006) brings together three highly acclaimed artists in an intimate and improvisational dialogue that gives voice to our primal origins within the earth, and breathes life into all things created of the earth; our vesels, our instruments, ourselves. Ceramic Artist Rod Kendall of Olympia, WA creates ceramic versions of traditional ethnic instruments from the modern and ancient worlds as well as his own unique creations. Native-American cedar flutes, African gourd drums, and Peruvian clay whistles are a few of the inspirations for Kendall’s modern ceramic art pieces that not only display visual beauty, but also produce amazing sound. His work has been featured in exhibitions, numerous recordings, and the book and CD “From Mud to Music” (Barry Hall, author; American Ceramic Society, publisher; 2006.) World Music Flutist Gary Stroutsos, Seattle, is an international recording artist, composer, performer, and educator. His music is influenced by American Jazz, Afro Cuban, Native American, and Asian styles with a strong respect for native traditions and their reverence for the earth. His work includes numerous recordings and concert performances, inlcuding that showcased on the Ken Burns PBS documentary “Lewis and Clark: Journey of the Corps of Discovery” which led to a command performance at the White House for President Clinton in 1997. His 2006 “Sacred Clay: Japan” (WaSabiDou, producer) tour featured performances at several sacred sites including mountain Buddhist temples, the Mashiko Ceramic Museum, and the interior of an old Tokoname kiln that seated an audience of 65! Master Percussionist Will Clipman of Tucson, AZ is a four-time Grammy nominee and two-time Native American Music Award wnner. He has over fifty recordings to his credit and is the percussionist for the R. Carlos Nakai Quarter and the William Eaton Ensemble. Will is also a well-published poet and a distinguished arts educator. His long-standing contributions to the art community have led to his induction into the Tucson Musicians Museum, the Arizona Commission on the Arts Award of Merit for Poetry and Decade of Distinguished Service Award, as well as a Governor’s Arts Award Nomination. “Sacred Clay” is packaged to be friendly to the environment (no plastic case) and affordable for clay enthusiasts. Ships domestically USPS First-class for $3.00 total - up to 3 units. Additional orders can ship USPS Priority or Flat-Rate Priority depending on volume. Volume order discount inquiries are welcome. Custom Instrument Inquiries for Rod Kendall also welcome. Check out instrument photos on this listing's enlargements. –WaSabiDou.